We all have days when we really need to be at our best. 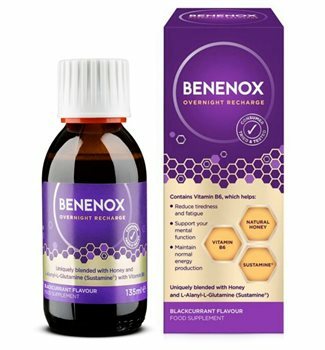 Benenox, is a unique and patented combination of honey, Sustamine® and Vitamin B6 which, when taken before bedtime, helps you make the most of the next day. In a study of 140 consumers who had taken Benenox nightly for 1 week: 81% were pleased with the results. Benenox can be chosen as a complement to the diet by people on the go, those facing daily pressures, and those with busy and demanding schedules. Honey is a food that has been acessible to humans throughout evolutionary history, and has been used for many years as a component of nigh time drinks. Benenox is a blend of honey with Sustamine® a combination of two amino acids L-Alanine and L-Glutamine which can be absorbed quickly by the body, and Vitamin B6, a vitamin which has been shown to help reduce tiredness and faigue, support normal psychological function and help energy production. Honey, Glycerol, Water, L-alanyl-L-Glutamine dipeptide (Sustamine®), Lemon Juice Concentrate, Blackcurrant Flavouring, Preservative: Potassium Sorbate, Vitamin B6.